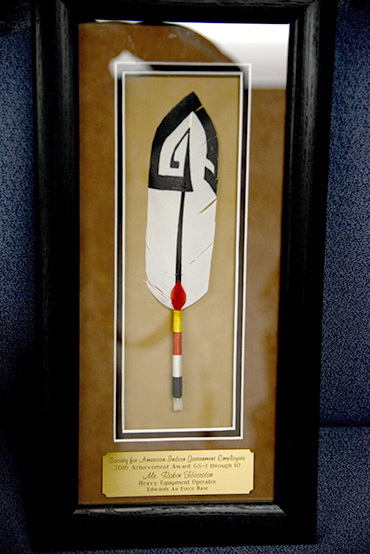 The Society of American Indian Government Employees presented Robin “Bubba” Hairston of the 412th Civil Engineer Group with this award for his contributions to the Edwards mission and to American Indians in government service. A member of the 412th Civil Engineer Group at Edwards Air Force Base, Calif., was recognized for his contributions to the Edwards mission, and to American Indians in government service. Robin “Bubba” Hairston, a 412th CEG heavy equipment operator, travelled to Tulsa, Okla., last week, where he received Meritorious Service Award from the Society of American Indian Government Employees (SAIGE) June 7. The award commends Hairston for displaying an exceptionally high level of dedication and professionalism in the performance of his duties. 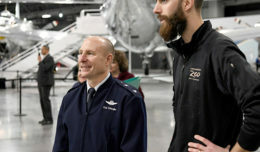 David Sampson, 412th Operations Support Squadron airfield manager, praised Hairston as one of the most conscientious flightline workers he knows of. 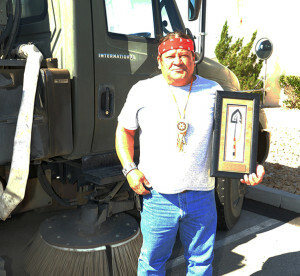 Heavy equipment operator Robin “Bubba” Hairston, 412th Civil Engineer Group, poses in front of his sweeper truck with the award he was given by the Society of American Indian Government Employees. The award was for his contributions to the Edwards mission and to American Indians in government service, and was presented during a ceremony in Tulsa, Oklahoma, June 7, 2016. One day on the job, Hairston was running the sweeper on the flightline when he noticed a C-5 taxiing out. 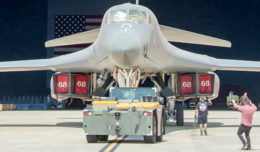 Hairston’s award nomination stated that the aircrew confirmed that the C-5 would have suffered catastrophic failure of the hydraulic system if the aircraft had flown. His actions potentially saved the aircraft and its entire crew. Hairston is also responsible for saving the life of a coworker. Hairston’s award also cites his active support for the local community as a member of “Blue Mountain Tribe,” an all-Indian rock band. The group performs at many local events, and through their performances they endeavor to help impoverished families.